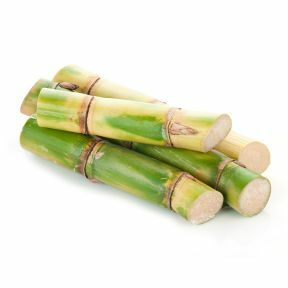 Sugarcane predominately grows in the tropical and subtropical regions. They have stout fibrous stalks that are rich in sugar, and measure six to nineteen feet in tall. The varying types of sugar products are made from sugar cane such as basic sugar used in different recipes, commercial enterprises can make use of the sugar to create molasses, sodas and other soft drink products, and a variety of sweeteners. Handling: Stored at approximately 45°F in relatively dry environment. 5-7 day shelf life. Varieties: Yellow Gal, White Transparent, Home Green, Louisiana Ribbon, Louisiana Purple, Louisiana Striped, Green German.